The benefits and beauty of grasses are overlooked. Without the swaying blades and varied colors of grass, the world would be drab and abrupt for much of the year. Without the roots of grass ensnaring the soil, the land would wash away, without the interlocking roots and flat blades our water and air would be dirty and cloudy, and without the tenacity of grass man would be forced to work continually to grow food. Grass is the main plant type used for forage. Whether domesticated animals or wildlife, grass is the mainstay of many creatures. This is because of the numerous grass types, their adaptability to many locations, and their tenacity. Grasses are often combined with legumes because legumes fix nitrogen in the soil, are high in nutritional value, and have a variety of types and valuable traits. Although the livestock industry on the U.S. is very productive, some other areas of the world are more productive largely because the operators look at themselves as grass farmers who utilize livestock to harvest their grass instead of viewing themselves as livestock managers. This perspective sets into motion the correct sequence of priorities to develop a successful forage-livestock system. Excellent animal management skills are needed but often are not used in conjunction with strong forage management skills. 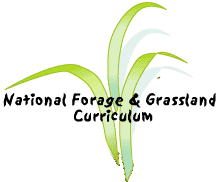 This objective will offer guidelines in how to develop grass farmers for a productive forage-livestock system. The basic premise of forage-livestock managers is to utilize their land so that it can produce high-quality, high-yielding feed for the least amount of money or damage to the environment. This principal portends less feed will need to be bought and brought to the the farm if proper forage management is practiced. Historically though, farmers have not always seen the need to manage forages for their livestock. Grain has been cheap enough at times to allow farmers to overlook the sustainability of the plant-animal-soil continuum on their own farms or ranches and buy cheap feeds. But besides the financial considerations, forage-livestock systems should consider the ways grass interacts in a sustainable environment. Grass provides excellent feed for animals but also gives back to the environment and when properly managed can provide many additional products. Grass can be used to improve soil, reduce erosion, feed animals, absorb manure, establish borders, clean air, purify water, provide habitat for wildlife including bees, protect waterways, and provide grain for humans. Utilizing grass wisely will consider all these aspects. What kind of livestock will be fed by forages? How many animals will need to be fed? What type of feed is important to the livestock? Which grasses can provide the needed feed qualities? Which grasses are best adapted to the location? Should the grass be used in combination with other species such as legumes? Will other feed be needed for part of the year's feed ration? What types and how much harvested feed is needed? What management practices will help the grass remain healthy? Understanding what livestock will need to be fed leads to learning which grass will provide the best nutrition for better performance. Different livestock have different nutritional needs and different grasses influence animal performance differently. Lactating animals have high nutritional requirements and need high-quality forages, while race horses and recreational horses have different performance expectations and may have different diets. In addition, grass species have different optimum planting times and different growing seasons. When managing grasses, forage producers have many opportunities to do things in a timely fashion. Establishing a grass pasture at the optimum time leads to a strong stand, which has higher yields, better quality, and persistence. Timely herbicide application can reduce weeds and competition, allowing grasses to thrive. Appropriate stocking rates (number of livestock permitted to graze) and harvesting at the best times can greatly influence the forage quality, stand composition, animal performance, and effective use of forage which saves time and money. Once the livestock type is determined and time issues are noted, the successful use of grass means selecting a variety that will be productive in that location. Forages should be selected by matching the edaphic (soil), climatic, geophysical features, and biotic stresses of the variety to the location of the forage-livestock system. Selection tools are discussed in a different lecture but can be very helpful in learning about how grasses fit into a successful operation.